I have had some interest in how I do my bases so I thought I'd do a step by step for people... and a little preview of what is coming up. The base pictured to the right is what I will be showing how to do. This is from the Goblin Warchanter that I painted end of last year. It is a really simple base to do and one that I fall back to a lot, especially for hordes or armies. First step is to trim the plastic "broccoli base" attached to the model so that it fits on the actual base. It works better if the cut is angled to create a slope. This makes it easier to build the sand up to the model. Once it is trimmed, glue the model to your base. I use super glue. I then put PVA glue around the broccoli base, and on those angled edges and cover it with coarse sand. After letting it dry a little (15 -30 minutes) I cover the sand with another layer of PVA and more course sand. I do this until it is roughly level with the top of the original base. This can take between 2-3 layers of course sand. The photo on the right shows models with different amounts of sand (the middle has 1 layer, the outside models have 2 layers). The sand is orange because it is just coloured sand I bought at a $2 designed for fish tanks and vases. Once that has dried a little I do the same thing again with a fine sand. (This sand I got straight off the beach) The only difference is that I cover the plastic base too. I just work around the feet. Finally I coat it all in another layer of PVA glue to seal it. When creating these bases I ran out of PVA and so used Tiger Glue - a strong tacky glue -to seal them. Unfortunately, while it worked, it created a slightly smoother texture - though this could work for smoother, weather-worn stone. The first picture in this post was using purely PVA glue and showed more detail of the fine sand. After the last step, I usually leave the bases to dry over-night. 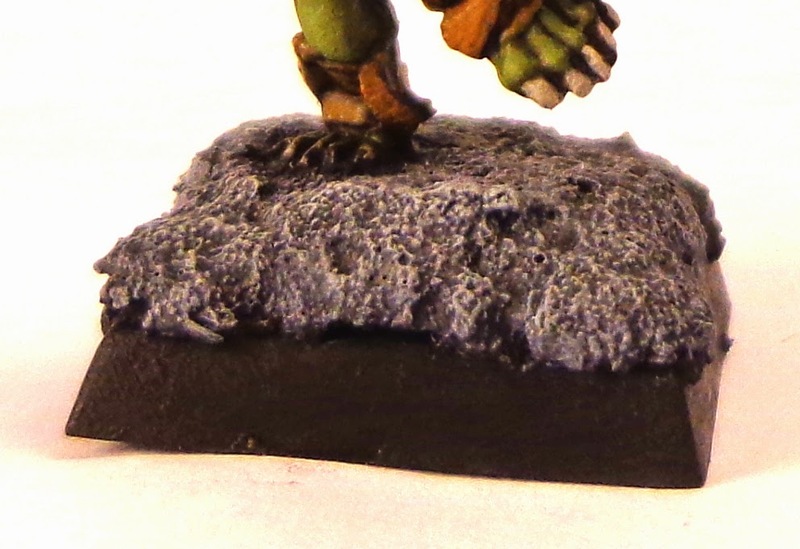 I then paint them a charcoal grey base colour. Finally I dry brush them with a very pale grey and I am all done. I have used this technique to base models both before I start painting (as with these models) and after I have painted the models. It really didn't make much difference. I did feel less nervous about ruining the paint job by doing the basing first though. So there you have it, a simple base tutorial. I hope you found this easy to follow and if you decide to try it out let me know - Id love to hear/see how it goes. Soon to come... the painted goblin war-band!